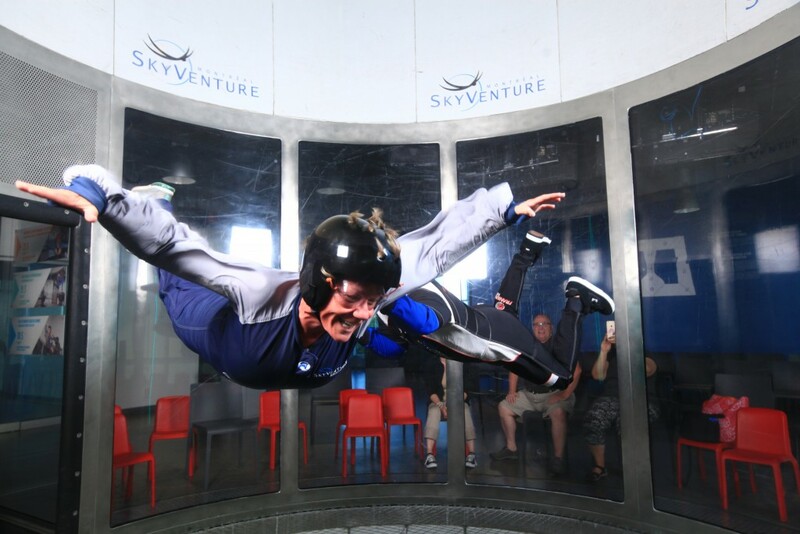 When I was visiting Montreal recently, the friends I was staying with, Helene and Clement, suggested I go flying at a place called SkyVenture. The next thing I knew we were inside said SkyVenture building, checking on availability for the day. But there wasn’t room for me to fly until 5 o’clock that evening. So we did. 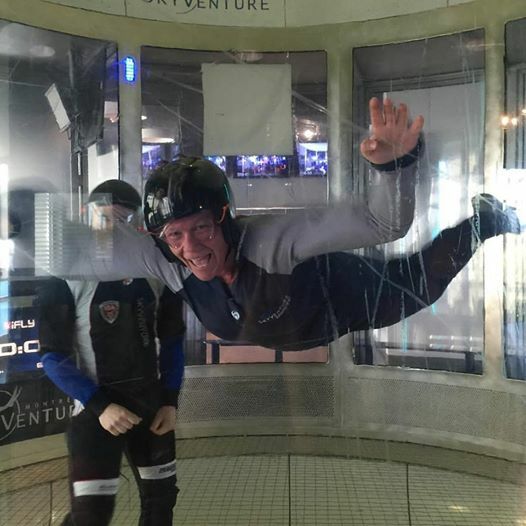 And let me tell you, those instructors – who were likely also professional skydivers – were flying around that wind tunnel like nobody’s business! They were doing backflips and kicking off from the sides and whipping around in circles and shooting lightning-quick from the grate at the bottom to the very top. It was awesome! Sure enough, after the pros had done their demo of the cool tricks, they returned to the business of helping schmucks like me attempt the basics of flying, which appeared to entail lying spread-eagled on your stomach – like Superman – and trying not to drop down to the grate at the bottom where the wind was blasting up through. But judging from the number of people who, despite the instructor’s repeated hand signals and actual hands-on assistance, kept dropping like a stone towards the grate then flopping around like a fish out of water, it actually looked quite tricky to do correctly i.e. remain in the air…to fly. That I would fail. That I would forget what the hand signals meant. That I, too, would drop to the grate and flop around like a big fat fish in a flight suit. But then I asked myself: so what? So I signed up for the 5 o’clock time slot. And when 5 p.m. rolled around, I listened carefully to my (oh so adorable!) instructor’s detailed instructions. I studied the hand signals on the wall as if my life depended on it. Even though my life didn’t, my ego certainly did. Then I climbed into my flight suit, put in earplugs, donned my helmet and safety glasses and awaited my turn to fly…or not. But I DID fly! 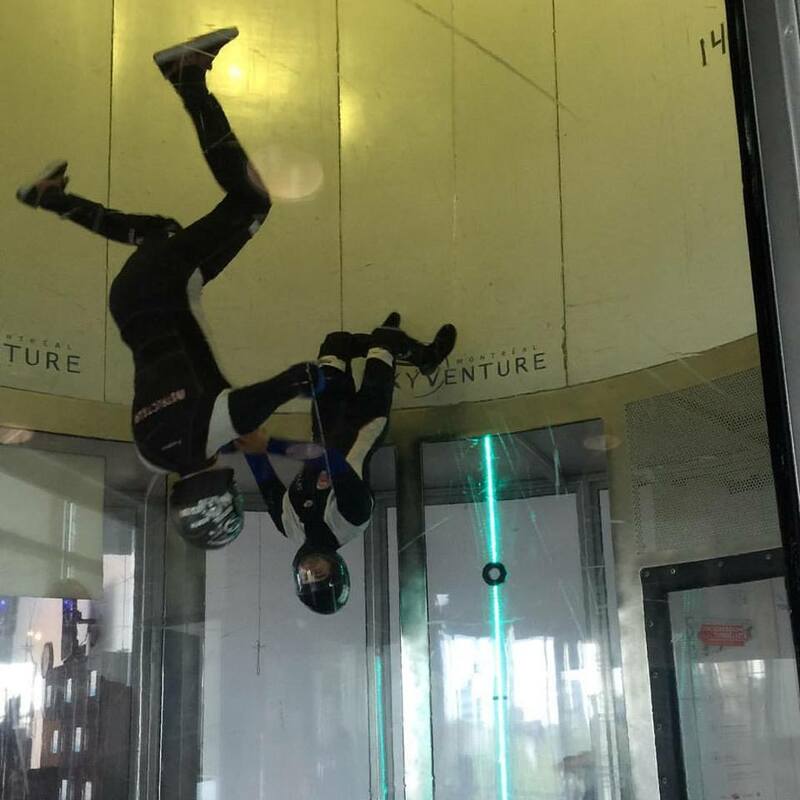 Sure, I dropped down towards the grate a couple of times at the beginning but when my instructor gave me the signal to straighten my legs, I did so…and voila! Up I floated again. 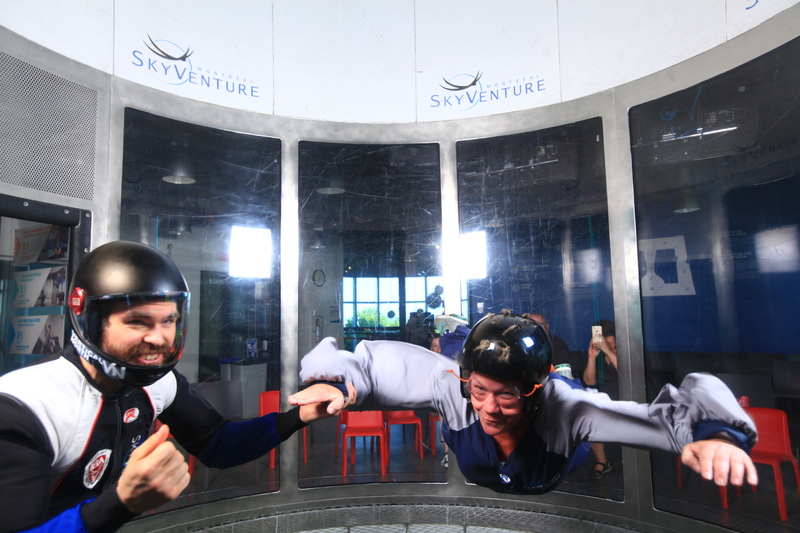 Interestingly, the key to flying (in a wind tunnel anyway) is to expose the maximum amount of one’s body surface to the wind. The tiniest tweak in one’s position significantly impacts whether one floats or sinks…and isn’t that a metaphor for life itself? Likewise, another trick we were taught is to keep your chin up – because that ensures your back is arched, thereby exposing more surface area on the front of your body to the wind. I loved the experience of flying. I loved how I overcame my fear of forgetting and/or failing and/or looking like an idiot. I loved the sense of accomplishment that came from succeeding at something completely new to me. That was a great article and a challenge. I so appreciated your last paragraph. 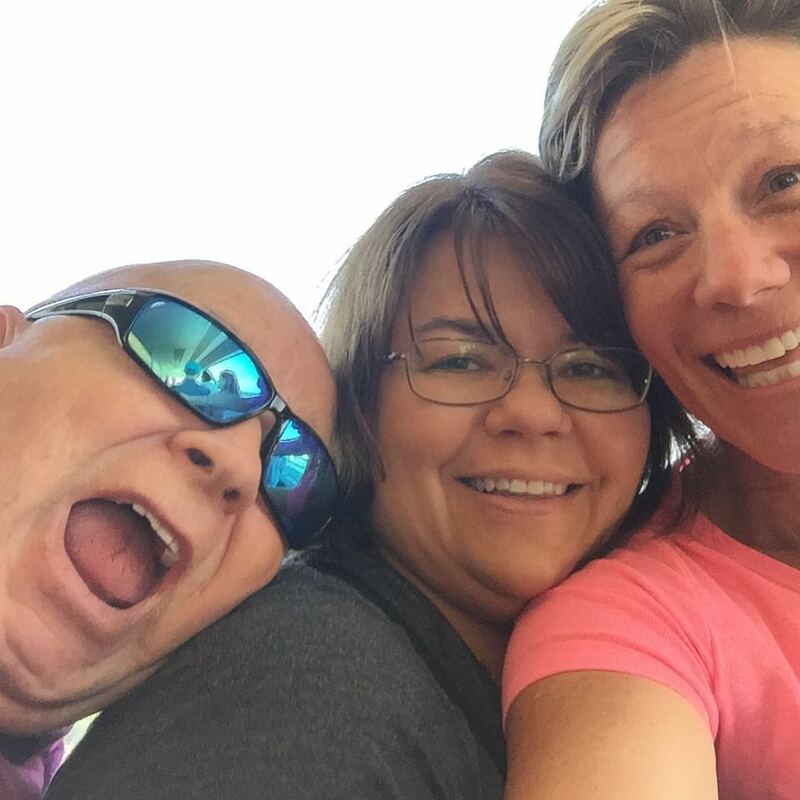 It’s always important to have people along with you encouraging and cheering you on. THEN also remembering we are to do the same for others. Good word!! Have a great long weekend and Happy Canada Day!